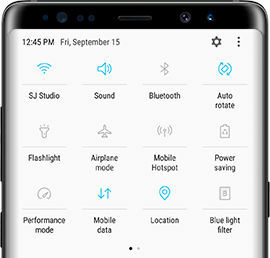 Galaxy Note8: How do I use the notification panel on my Samsung Galaxy Note8 (SM-N950W)? In today’s world, it’s all about staying plugged in. 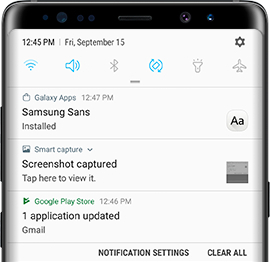 Make sure you never miss a text or call by checking out the notification panel on your Note8. You can view recent messages and access functions on your phone. Note: There’s a new update for Google Chrome you need to see — check it out on the Notification panel. It’s so easy to access. 1. From the Home screen, swipe down from the top of the screen. 2. 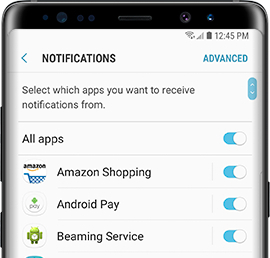 Notifications will be listed under the Quick Settings panel. • To open a notification, touch it. • To clear a notification, swipe to the left or right. • To clear all notifications, touch CLEAR ALL. 3. To close the notification panel, swipe up or touch Back. • To allow an app to send notifications, touch the slider. When enabled, the slider will turn blue. • To deny an app from sending notifications, touch the slider. • To allow all apps to send notifications, touch the slider next to All apps. Note: Certain settings on your phone have shortcuts built in. Say the captain’s preparing for take-off and that flight attendant just reprimanded you to turn on Airplane mode. With a few swipes, you’ll be good to go. 1. To access the Quick Settings panel, open the notification panel. 2. To view all available quick settings, swipe down from the top of the screen. 3. To activate or deactivate a quick setting, touch the desired setting.